Twenty years ago in Brazil, Dan Weiss founded Amizade, which means “friendship” in Portuguese. Twenty years later in Pittsburgh, this same man reminded us that the universal language of friendship keeps over 8,000 Amizade’s volunteers connected to different communities all around the world. We kicked off the celebration a few days before the main event with the arrival of our site directors in Pittsburgh. 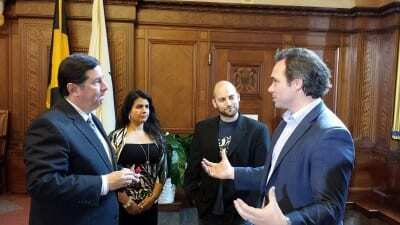 One of the highlights of the weekend was a visit to the office of Mayor Bill Peduto, who declared November 1st, 2014 Amizade Day in the most livable city of Pittsburgh. Another great moment was the Site Director’s Summit, an opportunity to evaluate and rethink practices as a group. Bolivia’s Jean Carla Costas, Appalachia’s Nate Siggers, Brazil’s Micah Gregory (virtually), Poland’s Anna Kraus, Navajo Nation’s Melissa Woody, Jamaica’s Matthias Brown, Trinidad & Tobago’s Beulah Joseph-Clunis, and Puerto Rico’s Eugenio Lopez Matos joined the summit, featuring founder Dan Weiss, past Executive Directors Mike Sandy and Eric Hartman, and the current Executive Director Brandon Blache-Cohen. The Summit, which including both practical training as well as reflection and story sharing, was such a great way to set the stage for such a meaningful weekend. 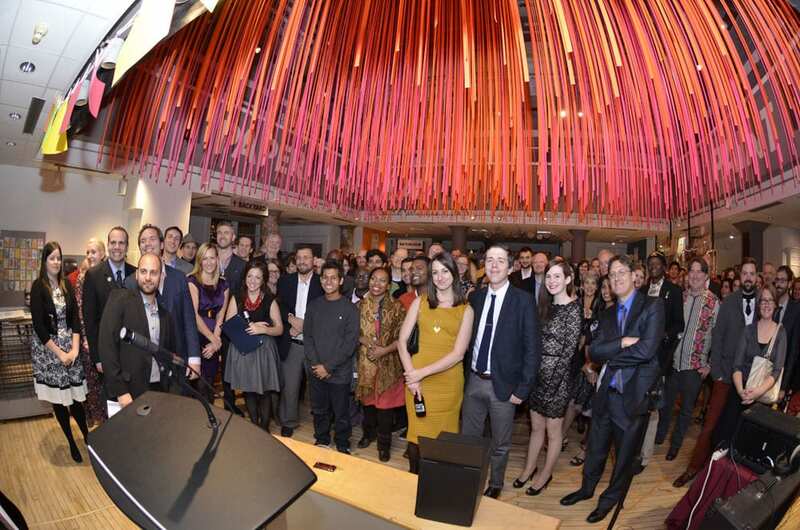 Nearly two hundred people attended the Amizade’s 20th Anniversary Celebration & Fundraiser at The Children’s Museum. The VIP Reception opened with music from Matthew Tembo while everyone enjoyed a delicious dinner of paella, curry, and sandwiches catered by Mad Mex and Kaya. Amizade was honored to have longtime friend, alum, and former intern Ryan Gayman as the event host, introducing speakers including Melissa Woody, who exemplified how Amizade’s participants and communities help each other through priceless life experiences all around the world. Walter and Betty Lou Weiss reminisced about the early days of Amizade while Mike Sandy led the room in a toast. Finally, Amizade’s current Executive Director Brandon Blache-Cohen spoke about the legacy of engagement, connection, and contribution of Amizade throughout the last twenty years. The main event was a lively celebration that opened with a proclamation from Councilman Tom Baker declaring November 1st Amizade Day in Allegheny County. The night also included inspiring speeches from past Executive Director Eric Hartman as well as the introduction of the Amizade Hall of Fame and it’s first inductees, Marvin and Martie Wachs, Jean Carla Costas, Mathias Brown, Steven Winn Alexander, and founder Dan Weiss who was awarded a Lifetime Achievement award. The inductees were celebrated and praised for their years of service and incredible contributions to Amizade. Together, Amizade friends, alumni, staff, site directors, and supporters enjoyed live music, food, desserts, dancing, and several even took home fantastic raffle prizes. In the end, we couldn’t have asked for a better way to celebrate these twenty years of friendship, learning and service. A special thanks to The Children’s Museum of Pittsburgh, Matthew Tembo, Let Them Eat Cake, big Burrito Catering, our dessert and raffle donors, and all of our wonderful volunteers who helped in making this incredible celebration. Congratulations on the fine blog and images. That fisheye image is spectacular! And thanks for representing me at the event.